LOS ANGELES (AP) — From laughingstock to lift off. Altuve, one of four carry-overs from a club that lost an embarrassing 111 times in 2013 after switching from the NL to the AL, and this collection of young stars silenced Dodger Stadium from the get-go, taking a 5-0 lead in the second inning. On the other side, ace Clayton Kershaw and several Dodgers leaned against the railing in the dugout, watching the Astros celebrate. Los Angeles led the majors with 104 wins and a $240 million payroll, and rallied to win Game 6, yet it didn’t pay off for part-owner Magic Johnson and his team. Springer hit his fifth homer — tying the Series mark set by Reggie Jackson and matched by Chase Utley — when he connected for a record fourth game in a row, making it a five-run lead. That was plenty for Houston manager A.J. Hinch. 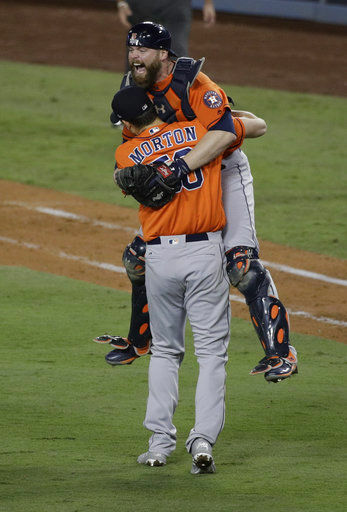 He pulled starter Lance McCullers Jr. soon after the curveballer crazily plunked his fourth batter of the game, and began a parade of four relievers that held the lead as the unconventional Astros overcame a shaky postseason bullpen. 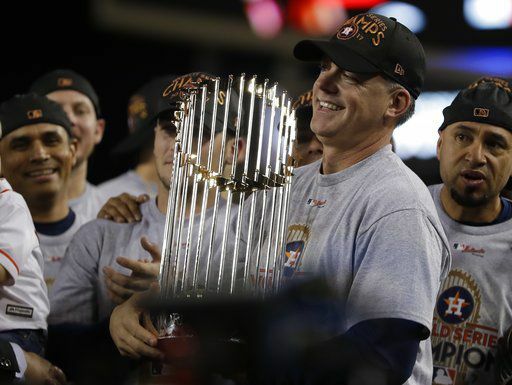 Forever known for their space-age Astrodome, outlandish rainbow jerseys and a handful of heartbreaking playoff losses with stars like Nolan Ryan, Jeff Bagwell and Craig Biggio, these Astros will be remembered as champions, finally, in their 56th season. The club that wears a star on its hat also filled out the Texas trophy case. Teams from the Lone Star State had won most every major crown — Super Bowl, NBA and NHL titles, championships in college football, and men’s and women’s hoops — except the World Series. 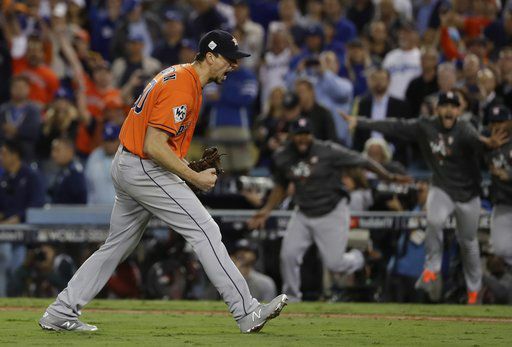 Built on the skills of homegrown All-Stars Dallas Keuchel and more, helped by veteran offseason acquisitions such as Carlos Beltran, who won his first ring, and Brian McCann, and boosted by the slick trade for Justin Verlander, general manager Jeff Luhnow completed the ascent that some predicted after the club purged payroll and stripped down to bare bones. Famously, now, there was the Sports Illustrated cover in 2014 — after Houston had lost more than 100 games for three straight years — that proclaimed: “Your 2017 World Series Champs” and featured a picture of Springer in a bright Astros jersey. Kershaw provided four shutout innings of relief for Los Angeles, but it was too late. What the Dodgers really needed was a better starter than Darvish, someone more like the lefty who tossed out a ceremonial first ball: the great Sandy Koufax. 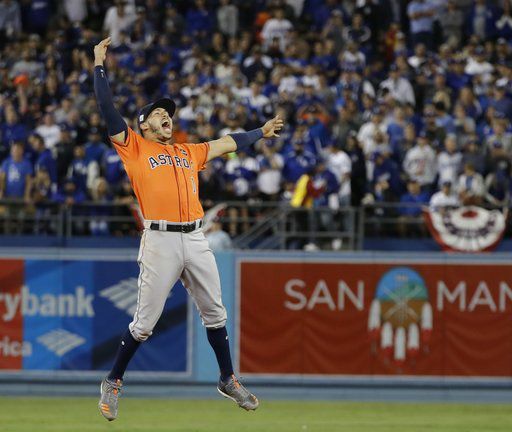 After Springer lined a leadoff double, Alex Bregman hit a bouncer that first baseman Cody Bellinger threw past Darvish for an error, allowing a run to score. Bregman aggressively stole third and scored on Altuve’s grounder, and it was 2-0 after eight pitches. A double by Marwin Gonzalez helped set up perhaps McCullers’ biggest contribution, a slow grounder for his first pro RBI. Springer followed with a no-doubt, two-run drive into the left-center field bleachers.